The penguin colony at Loro Parque has recently welcomed a new family member as a Chinstrap penguin chick was born in PlanetPenguin. This birth is considered a real success as it is a very delicate penguin species, which poses quite a challenge in its breeding. 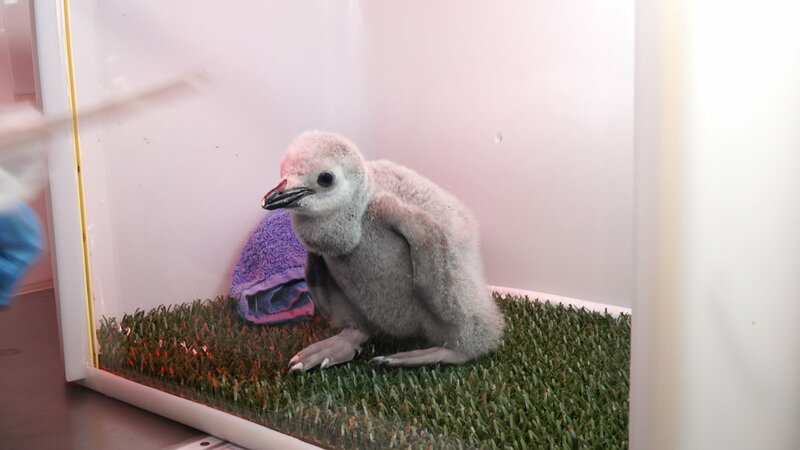 The chick was born weighing 88 grams and spent its first days in a hatcher of BabyPenguin where it was hand-reared. At this time, the penguin chick received 10% of its weight in blended fish, as well vitamins and calcium. During its first month and a half, the chick receives this formula five times a day every three hours; then this frequency is reduced to two meals a day, after which the young penguin starts eating solid food. Presently, the chinstrap penguin chick weighs 736 grams and has already started the integration process by adapting to its new environment until it is fully integrated with the rest of the penguins at Loro Parque. Chinstrap penguins inhabit the shore waters of the Antarctic Ocean; they are a medium size (46-61 centimeters) and weigh between 5 and 8 kilos. They are able to dive up to 70 meters deep, and their diet is mainly based on Antarctic krill, although they can also eat fish and other crustaceans whenever these are available. This new addition to the penguin colony, along with four other rockhopper penguin chicks, promises yet another successful year at the penguinarium of Loro Parque. The birth of new chicks is, above all, a good indicator of adequate animal welfare as it demonstrates that all the necessities of the animals are effectively and properly covered, and they can reproduce normally. Loro Parque considers every single detail when it comes to animal care. In PlanetPinguin not only that their natural habitat is recreated, with 12 tons of snow generated daily, but also the Antarctic light cycles are respected all throughout the year. Presently, the penguin family at Loro Parque is enjoying the polar summer with plenty of light and longer days than in winter.